The Wakatipu Basin, with Queenstown as its main town and Arrowtown a secondary town, is a key location for the war between wilding pines and humans. On the human side, the war is led by the Department of Conservation (DOC), but there are also lots of community volunteers. There are battles to be fought. It is not clear who is going to win. 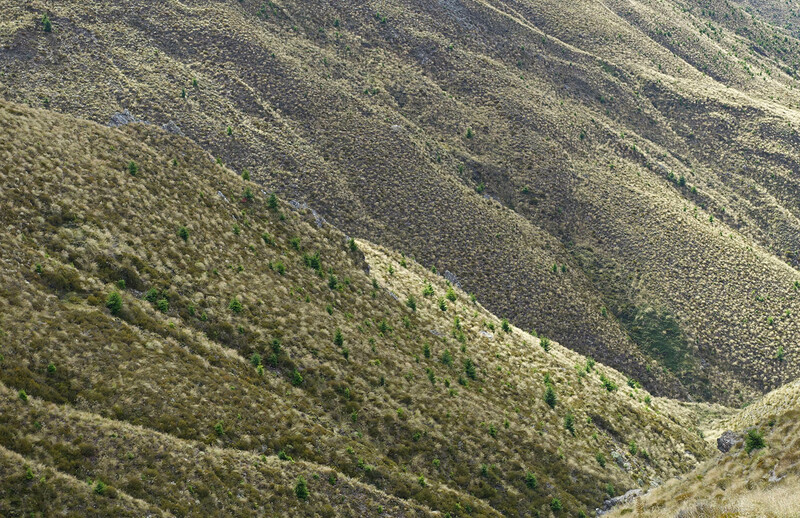 New Zealand’s wilding pines include at least 11 species. They can be any North American or European conifer which has blown in on the wind to where it was not intended to be. And that is what is happening across the tussock grasslands of the South Island. In its natural state, the Wakatipu Basin was stark. There were very few trees. And so the early European settlers planted trees that came from their homelands. These trees have greatly softened the landscape. Indeed much of the beauty of the valley floors is associated with these trees, particularly the deciduous trees in autumn. The problem is that some of the evergreen conifer species are now marching across the landscape and invading the higher country which gives the Wakatipu Basin its grandeur. Remarkably, they can out-compete the natural vegetation and can thrive up to at least 1500 m altitude, far above the natural bush line. Over time they become a total smother. In a broader South Island context, realisation as to the dangers of wilding pines came slowly. 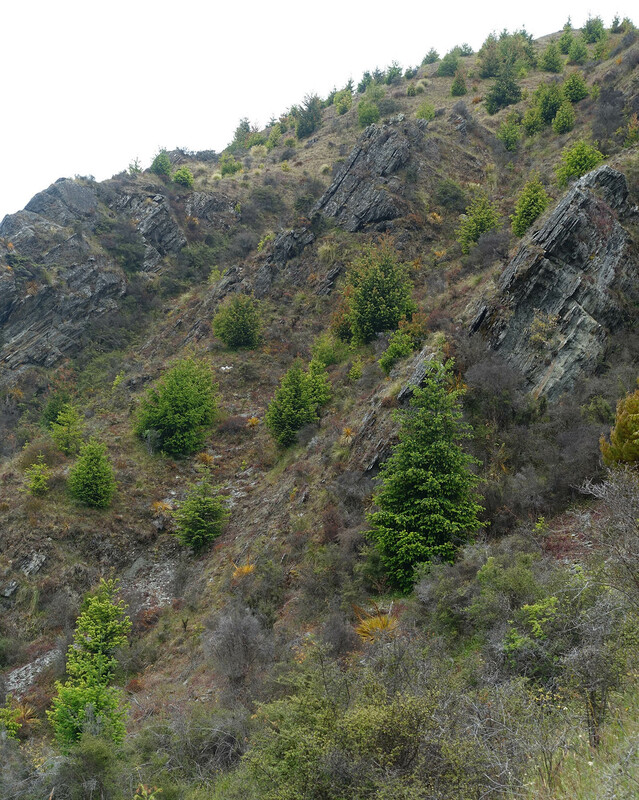 I recall in the 1960s that the government’s Forest Research Sevice was actively researching the potential of conifers to stabilise shingle slides in the Canterbury Alps above the natural bush line. Those were the days when conventional wisdom amongst soil conservators was that the shingle slides were largely man-made and something needed to be done before our mountains washed away. Then later in the 1970s I recall the Government was planting pines to secure land adjacent to Lake Pukaki that had been destabilised by hydro-electricity developments. By the late 1970s, there were glimmers of insight that wilding pines might be a problem. Around that time I regularly used to travel with Dr Peter Wardle, a botanist with Botany Dvisions of DSIR (which later morphed into Landcare), from Canterbury to the West Coast for meetings of the Westland National Park Board, of which we were both members. I recall Peter explaining to me how he knew, as a botanist studying the plant communities on the fringes of the shingle slides, that the shingle sides had been there for thousands of years. I also recall stopping with Peter to inspect wilding pines near Lake Lyndon, to check whether they were the contorted and rapacious Lodgepole pine (Pinus contorta). This was also about the time that Dr John Hayward from the Tussock Grasslands and Mountain Lands Institute was leading research identifying the natural forces that determined much of the erosion in those unstable mountain lands. I also recall returning to New Zealand in 1992 after an absence of ten years and being shocked by the changes occurring on the north bank of Lake Pukaki from wilding pines marching across the Mackenzie Country from Mt Cook station, where many thousands of trees were planted under the stewardship of runholder Donald Burnett. And then when I returned eight years later in 2000, I was further shocked by the onward march. 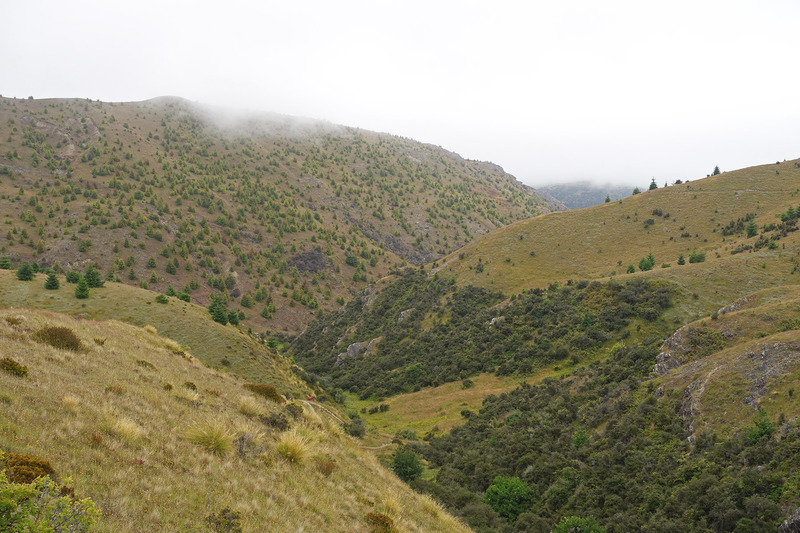 Since then the wilding pines have increased exponentially in both Canterbury and Otago. The dryland tussock landscapes are changing. 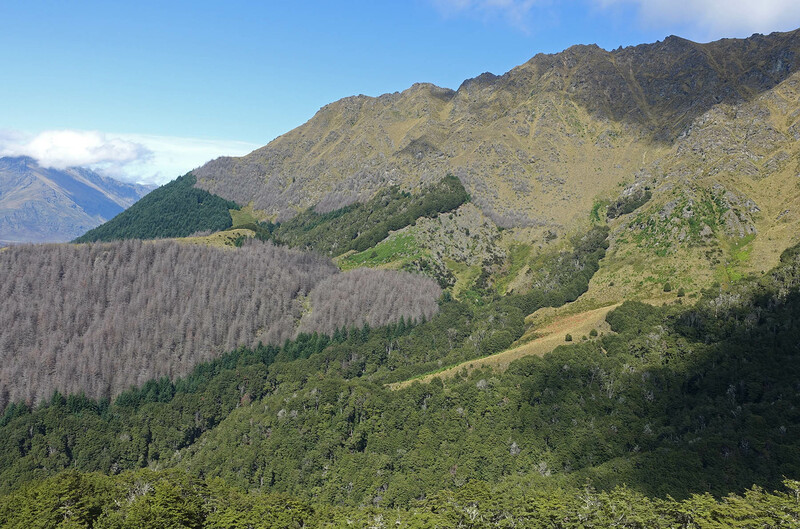 In recent years, DOC has geared itself up for a massive campaign against the South Island’s wilding pines. Currently they are winning some battles but I am not sure they are winning the war. It will require a huge ongoing effort. All of the photos that follow were taken in January 2019 as my wife Annette and I wandered the trails of the Wakatipu Basin. 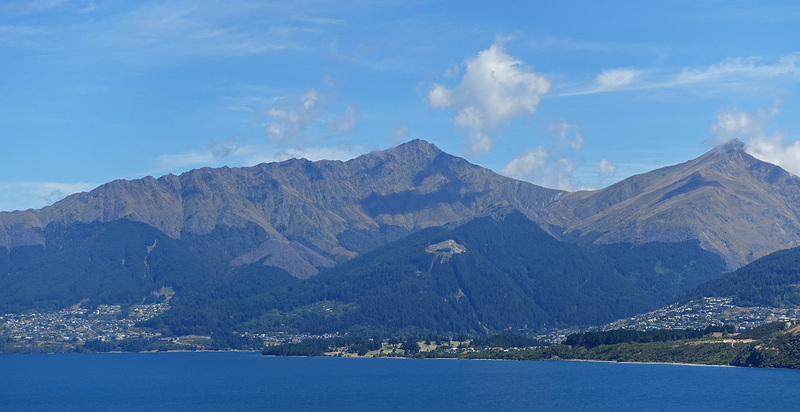 Queenstown, Ben Lomond (centre) and Bowen Peak (right) viewed from Jack’s Point. The dark vegetation above the town is wilding pines. 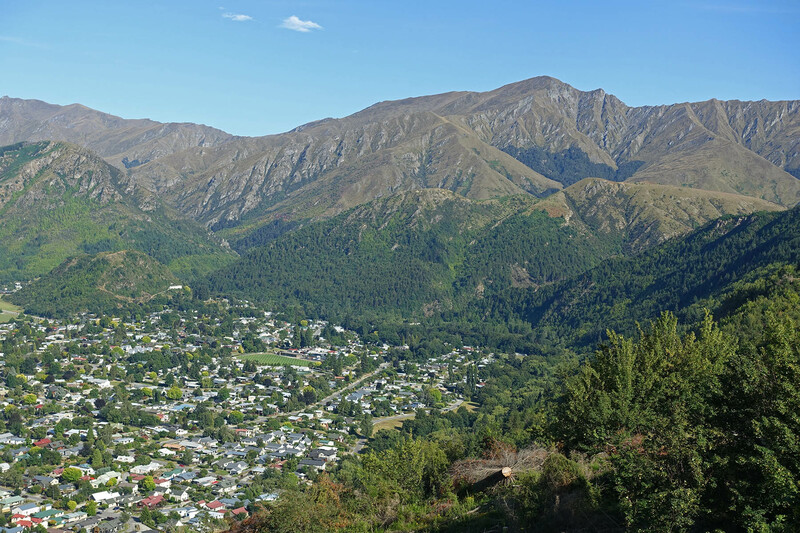 Arrowtown with Brow Peak on skyline. The wilding pines behind the town have potential to grow through to the skyline, beyond the native beech (triangular patch below the peak). Wilding pines marching up the mountain on Bowen Peak. In time they will produce a total smother. Looking across Sawpit Gully above Arrowtown. Sawpit Gully. The pines march upwards, undaunted by the slope. This entry was posted in Land and water, Outdoors with nature, The High Country, Uncategorized. Bookmark the permalink. its that biochar guy stalking you again! Biomass from wilding management could be a great resource for low cost biochar production. There are a number of low cost production methods that can be considered. Some relate to artisan fire management and others using low cost equipment. In the USA, more high-tech equipment is being deployed for forest slash management (air curtain burners). These are now being modified to produce biochar instead of ash, to provide economic, soil and environmental benefits.